My Dad and I took a trip to Holland when I was about 9. I am not sure why my Mom didn't go, she may have been pregnant with Michele and didn't want to travel. I have so many good memories of that trip. Windmills, wooden shoes, flowers everywhere. 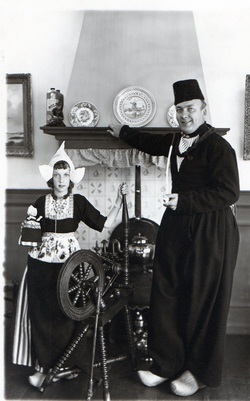 My Dad bought a full dress outfit for me, including wooden shoes and a little dolly that matched the outfit. Me with a pile of cheese in a market in Amsterdam. 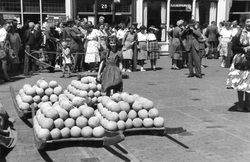 This was an outdoor market that sold all kids of cheese. I did not think the odor of the market was pleasant. 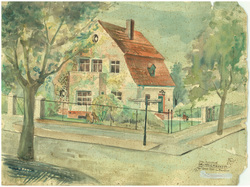 This is the house where we lived in Berlin from 1947-1948. I am in the picture holding my bear. My two doggies, Betty and Brosie are in the side yard. We lived in Berlin during the Berlin Airlift which occurred after the Russians closed all the roads in and out of Berlin. All goods, including food had to be brought in by air so the Germans could survive. There is a marvelous History Channel documentary on the Berlin Airlift. We were out of town when it happened and had to be flown into Berlin on one of the airlift cargo planes. 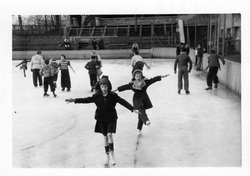 My friend Patsy and me at the ice rink in Bad Nauheim. I am in the front, Patsy behind me. 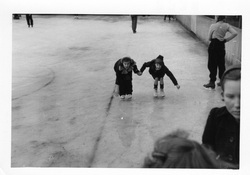 My Dad would take us to the rink and sit for hours in the cold waiting for us to skate. 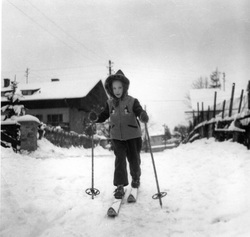 My Mother wrote on the back of this picture "Denise and Patsy showing off"
I learned to ski in Bad Heilbrun. My Dad would walk to the bottom of the hill and pull me back up because I couldn't get back up the hill by myself. Then we figured out how to put a rope around Betty and Brosie (our Boxer doggies) and they would pull me on the sled.